Libraries have always been among my favourite places. 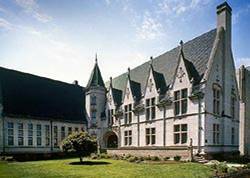 The very first library I visited was the West Scranton Branch of the Scranton Public Library. It was housed in a stately old house right across the street from my family’s church. It was there that I wrote my first paper, an essay on Benjamin Franklin. I submitted the paper to the annual Daughters of the American Revolution historical essay contest when I was ten or eleven years old. The paper made the first cut. Then I had to recite it from memory in front of the panel of DAR judges. I still cherish the medal I received for that paper and its recital. My ancestors did not travel over on the Mayflower. My grandparents came over on four separate boats at the end of the nineteenth and beginning of the twentieth centuries, emigrants from Italy. 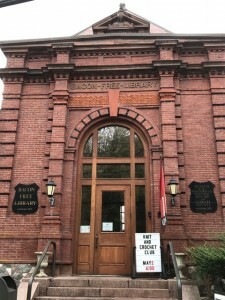 Their children were determined that their sons and daughters would get the most out of the public education system, and where better to extend that education than in the local library. That library is long gone, replaced by apartment buildings and parking spaces. I outgrew it when I entered high school and began to visit the main library, Albright Memorial, in the centre of the city’s government and cultural district. The Gothic Revival building was where I spent many Saturday afternoons doing research for my English, History and Social Studies papers. The second floor reading room is one of those spaces that occupies a corner of my memory as a cosy place to be. 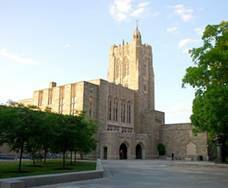 During the seven years I spent at Princeton University, first as an undergraduate and then as a graduate student studying architecture and urban planning, Firestone Library was where I spent the second most amount of time. First was the Architecture School, where all-nighters were common. The main reading room was a wonderful place to study. It is an expansive space, but being surrounded by other students who all appeared to be determined to make the Dean’s List for the first time, or stay on it, was an inspiration. When it came time to write my senior and Master’s Theses, there were individual study rooms that provided the kind of isolation needed for a concentrated effort. 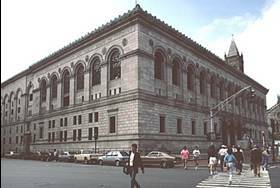 During the seventeen years I lived in the Boston, Massachusetts area, the Boston Public Library was a steady visiting point. This was well before the Internet, so if there was research that needed to be done, it was done in the library. McKim, Mead and White’s design had provided the spaces, and the dedicated librarians provided the content. As the third largest library by number of volumes in the United States, after the Library of Congress and Harvard University Library, there was nothing that could not be found if one was willing to spend the time needed. Just visiting Copley Square was a treat, with H.H. Richardson’s Trinity Church across the broad, open plaza from the library, and the Copley Plaza Hotel framing the third side with Boylston Street completing the frame. 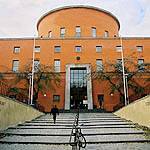 Erik Gunnar Asplund’s Stockholm Public library is a real pearl, both inside and out. It is a cylinder surrounded on three sides by long, rectangular shapes, and sits on a knoll at the northern edge of the inner city. It was opened in 1928, and remains one of the great Swedish architect’s masterpieces. Its terra cotta-colored forms serve as one of the capital’s orientation landmarks. What is most extraordinary about this building is the light that filters through the clerestory at the top of the cylinder into the book stacks that line the inside of the cylinder and then finds its way into the reading room below. My father, Lawrence Sena, captured the soul of this building in one of his best oil paintings which he completed from a photograph I supplied. Several years later, in 1982, he and my mother visited Stockholm and he was able to see the building with his own eyes. Located on Copley Square in the Back Bay of Boston, it shares the square with H.H. Richardson’s Trinity Church (1877), the Fairmont Copley Plaze Hotel, and the mirror glass-clad John Hancock Tower designed by I.M. Pei. and opened in 1976 on the 200th anniversary of the United States of America. During the eighteen years that we lived in the Göteborg region, this library was my office-away-from-the-office. It offered a perfect place to work right in the center of the cultural heart of the city. 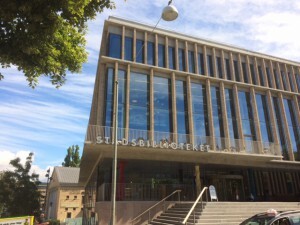 It was newly renovated and expanded in 2014. 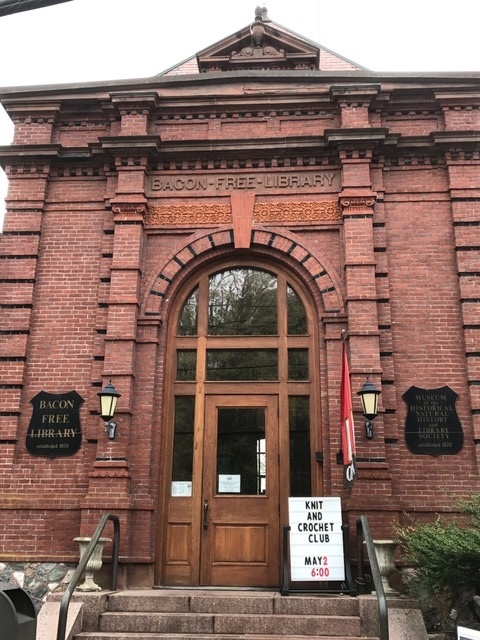 The Bacon Free Library in South Natick, Massachusetts was established in 1880. It continues to provide community library services and programs for the surrounding residents today. Located in the center of the village and situated along the bank of the Charles River, is has been my little work oasis where I retrieve e-mails before and after my visits to my good friends who live a short distance away.